I know that thankfully, today we have available such a large variety of gluten free pasta, however, our pasta is still full of starches. So if you are looking for something with less carbs, than this is perfect. 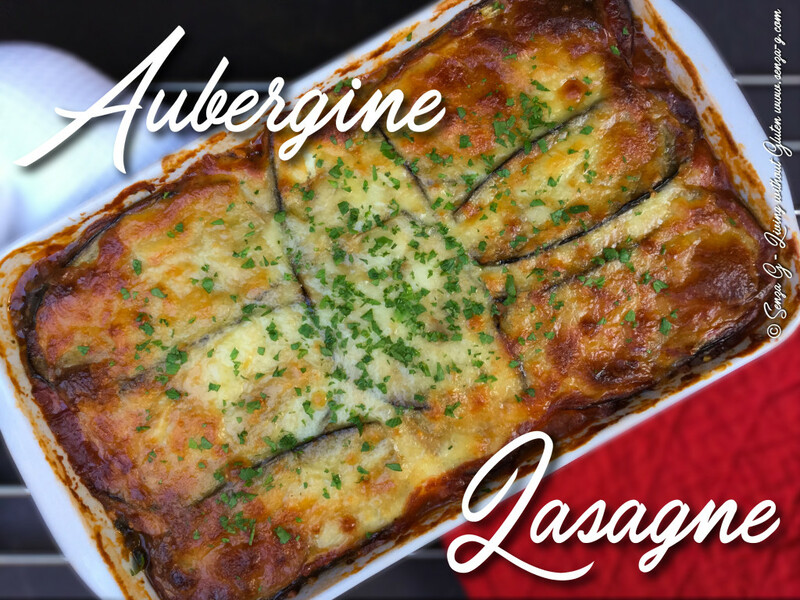 This lasagna uses aubergine slices in lieu of the pasta. You will not even notice there is no pasta….it is sooo good! Sprinkle salt on the aubergine slices and set aside. In the meantime, prepare the tomato sauce, by sauteing the onion, followed by the mushrooms. Add the garlic, stirring it in and then add the chopped tomatoes with their juice, the cherry tomatoes and the puree. Stir in the spices, herbs, sugar, stock powder and balsamic vinegar. Season. Bring to a boil, then lower the heat and leave to simmer. Prepare the ricotta by beating it in a small bowl, add a dash of nutmeg, add the beaten egg, salt & pepper and then stir in half the grated Parmesan cheese. Rinse and pat dry the aubergine slices. Place on a baking sheet, brush with oil and cook in a preheated oven at 190C until they start to brown slightly. In the meantime, slice the zucchini into circles. Divide into two equal piles. To assemble, line the bottom of a lightly greased oven proof dish with aubergine slices, top with one half of the zucchini slices, layered neatly. Spoon one half of the tomato mushroom sauce over the zucchini and then spoon the ricotta mixture spreading it to the sides. Sprinkle with shredded mozzarella. Repeat with the remaining ingredients finishing off with a layer of aubergine slices. Top this with more mozzarella and sprinkle over some more Parmesan Cheese. Place a large sheet of foil over the dish. A trick I used so that the foil does not stick to the cheese is by putting a toothpick in every corner in order to keep the foil raised. Place the dish in the oven and bake for about three quarters of an hour. Remove the foil and bake again for another 15 minutes or until the top turns golden brown. Leave to set before cutting.